My husband Mike and his brother-in-law Phil took off at 9 am this morning for the Hyatt Owners’ Meeting, held weekly at every Hyatt property. It’s a time when all Hyatt Vacation Club owners meet to talk, receive updates on changes to the different properties and talk about their “points” and how to use them. Phil is falling in love with the idea of a timeshare. He loves the idea of having a “home” property and trading it out to go other places, specifically non-U.S. places from the sound of him. 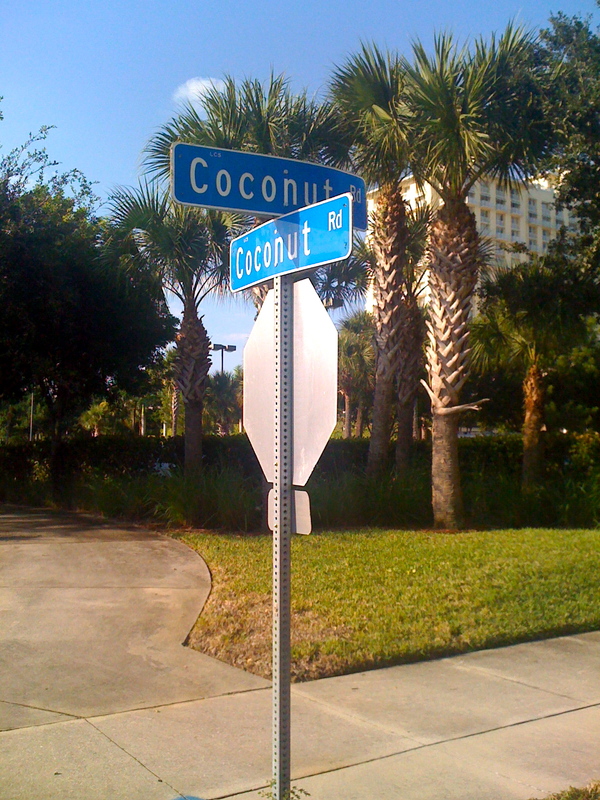 An important intersection on my morning walks. While the guys went off to the meeting I tied on my sneaks and headed out for a power walk, this time with Mike’s GPS watch strapped to my wrist. Mike loves a cool, practical gadget and I was mildly interested to see how it works. Well, I can tell you with satellite accuracy that I actually walked 4 miles on Sunday and 3 miles today. Who knew? I may just toss my old pedometer to the curb! 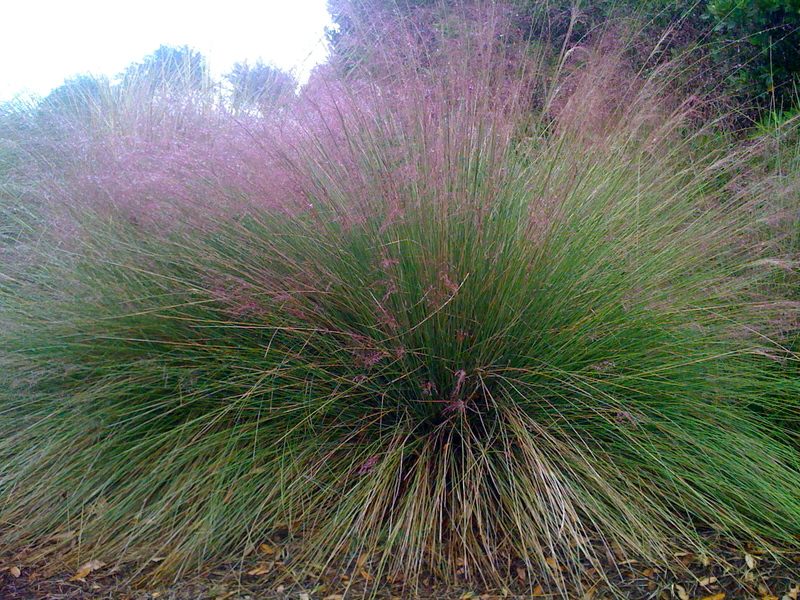 Landscapes here contain a lot of grasses; I think this one, which I pass every walk, is gorgeous. What do you think? 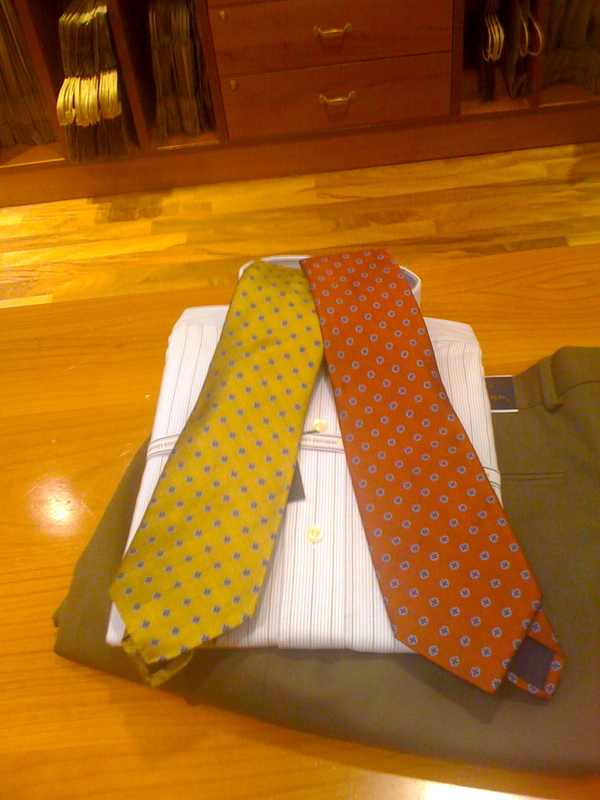 A new outfit from Brooks Brothers for Mike. Handsome! Since it was the tiniest bit overcast at midmorning, off we went to the local outlet mall where Mike proceeded to buy 2 pairs of dress pants, 3 dress shirts and 3 ties; he is now officially ready for fall work days. And me? I bought a DKNY denim skirt, a pair of jeggings (don’t ask; just google it and know I will be wearing them with boots and a longer tunic top!) and a terrific black dress with some sparkly shoulder action. Total bill? Under $100. Salesssss! I love salesssss! We lost sight of Betsy and Phil for a while but it all ended well! Keeping to the tight schedule Mike had us on we returned to the condo then power walked to the now-sunny and bright pool to relax. 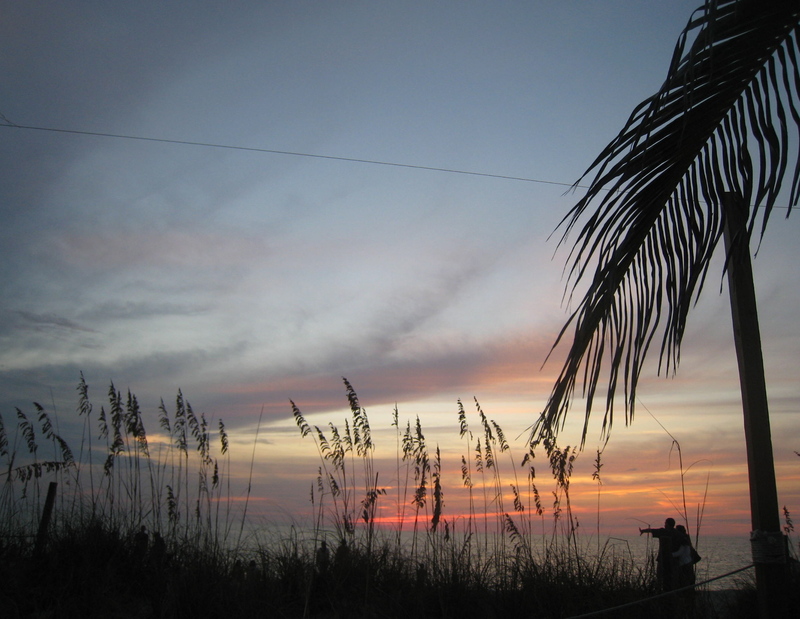 Two hours later we jumped through the shower and headed out to Sanibel and Captiva Islands. We wanted to show Betsy and Phil the local sights and watch the sun set from comfy chairs at the Mucky Duck (a quarter if you remember when I last wrote about the Mucky Duck!). 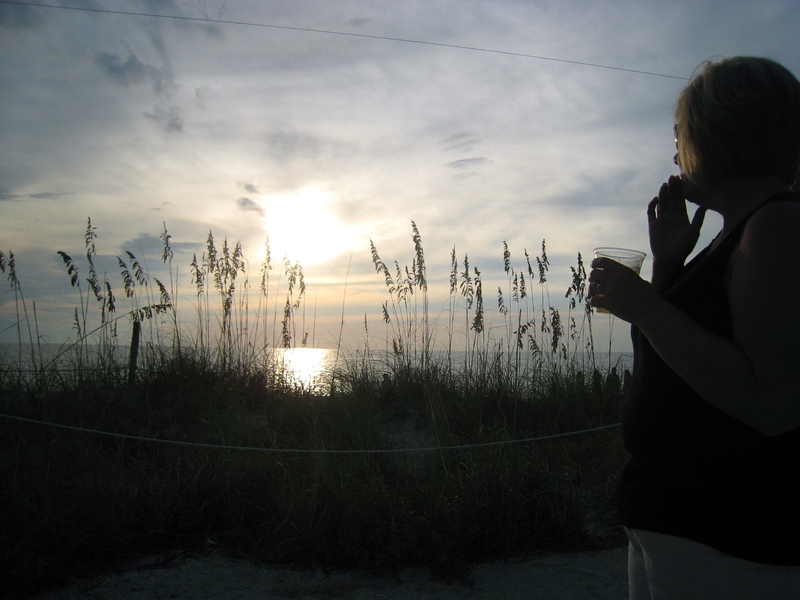 Betsy at sunset on Captiva Island. Well, we’re back at the condo now and all tired out. It’s off to bed. Sadly, Betsy and Phil take off for NJ tomorrow. We’ve had fun sharing a vacation with them, and the best part is that we’ve made new memories that we will dust off and talk about during our cold NJ winters. Gotta love that! I am soooooo jealous of your vacation! Hope you have wonderful weather and a great time!